Nusa Ceningan Island is the smallest among Bali’s three Nusa Islands, located between the more popular Nusa Lembongan and the larger and more exotic Nusa Penida. 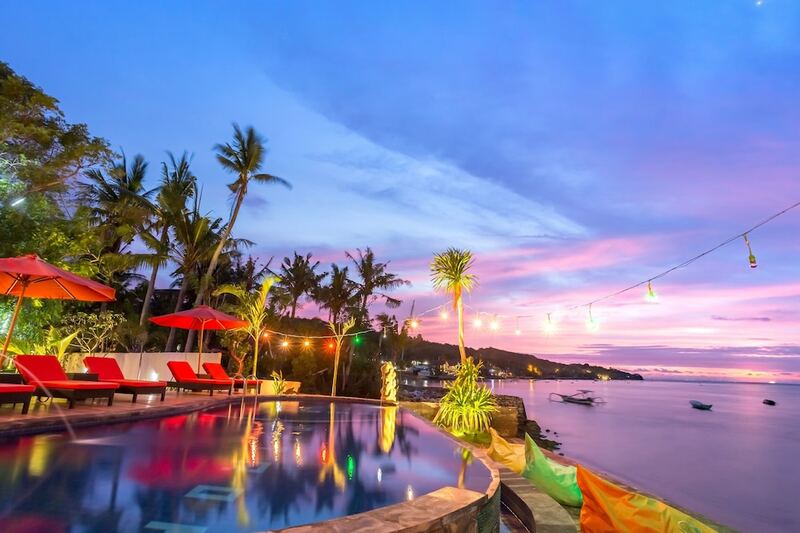 The island is often visited in combination with a trip to Nusa Lembongan, as they're conveniently connected by an iconic yellow suspension bridge that’s accessible by foot, bicycle or rented motorcycle. Both islands feature similar natural and cultural features like coastal fishing villages and seaweed farms. From this bridge, the views of the very narrow strait that runs between these two islands is spectacular. Nusa Ceningan might not have as many attractions as its more popular sibling, but that's part of its charm. On this lesser-visited island, you can enjoy a good stroll to see local life from up close. Around the coasts, you’ll enjoy sweeping seascapes dotted with traditional fishing boats and patches of green seaweed, as well as mangrove forests with turtle nesting beaches. Among the popular coastal spots are the Blue Lagoon, which provides a cliff-top vantage point; and Secret Beach on Ceningan’s southwest. For some action and adventure, on the left tip of Blue Lagoon you’ll find a cliff jumping point where you can test your inner daredevil for IDR 25,000 (USD 2) per jump, or simply sit back and enjoy seeing other people jumping down into the water below. There are hardly any lifeguards around, though, so it's not advisable for weak swimmers. Another cliff jump point is on the other side of the lagoon, called Mahana Point, adjacent the Pura Batu Melawang temple. If you plan to try these out, check the tides, wear reef shoes, and remember, it’s dangerous. Still, you can always visit these spots just for Ceningan’s incredible sunsets. Nearby Blue Lagoon, check out Driftwood Bar with its freeform infinity pool and zip line feature they call the Abyss Zipline. For IDR 80,000 (USD 6), you can go on a brief but adrenaline-rushing whiz over the crashing waves and cliffs, then calm yourself down in the pool with a drink. For a more placid way to enjoy Nusa Ceningan, you can go on a fun underwater scooter ride and explore a mysterious underwater garden, filled with sunken temples and statues.